Steve Spurrier, the Gators’ first Heisman Trophy winner who led Florida to its first national championship as coach of the program 30 years later in 1996, will be the honoree. The official new name: Steve Spurrier-Florida Field at Ben Hill Griffin Stadium. “I am humbled, honored, thankful and very appreciative that my alma mater, the University of Florida, believes that I am worthy and deserving to have my name placed on Ben Hill Griffin Stadium, also known as ‘The Swamp,'” he said. 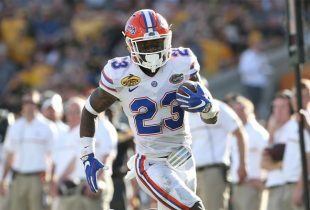 The decision was made by the University of Florida’s Board of Trustees with a ceremony set for Sept. 3 when Florida opens the 2016 season at home against UMass. “We feel this was an appropriate way to commemorate one the most legendary figures in Gator athletics history,” said athletic director Jeremy Foley. “Coach Spurrier did more than win a Heisman Trophy, a national championship and a bunch of games. Coach Spurrier changed the culture of Florida athletics. We were an institution that always had a mantra of wait until next year and wouldn’t it be great to just win one championship. 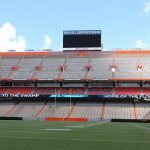 Originally built in 1930 as “Florida Field,” the stadium was renamed “Florida Field at Ben Hill Griffin Stadium” in 1989 following a generous donation by UF graduate and booster Ben Hill Griffin Jr. It received its nickname, “The Swamp,” in 1992 when Spurrier was asked to describe why the Gators had such a great home field advantage in the stadium. 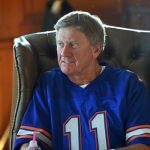 Spurrier went 122-27-1 (87-12 SEC) while at Florida, leading the Gators to their first national title in the 1996 season; he also won six SEC championships and seven SEC East crowns. Spurrier was named SEC Coach of the Year at Florida five times and took the Gators to a second national title game, which it lost in the 1995 season, one year before he returned to the game and won. He brought the Gators to the first five SEC Championship Games ever played and led the program to its first SEC title in 1991. Of course, his time at Florida will also be remembered for the introduction of the Fun ‘n’ Gun offense, which many believe helped revolutionize college football. As a player, Spurrier was a two-time All-America First Team selection; he won the Heisman Trophy and Walter Camp Memorial Trophy in 1996, the same season he was named SEC Player of the Year. Spurrier compiled 4,848 passing yards and 37 touchdowns at Florida, but he did more than just throw the ball, also serving as the team’s punter and kicker on occasion. The stadium’s name had not been altered in nearly three decades until this decision. Spurrier retired from college football in 2015 after serving as coach at South Carolina for nearly 11 full seasons. He has been around the Florida program more recently, even stopping in on practice during the spring session a couple of times. Already a member of the College Football Hall of Fame as a player (inducted in 1986), Spurrier appears on the ballot as a coach for the first time in 2016. Here is a career retrospective with trivia and quotes. Will Muschamp/Florida Field at Ben Hill Griffin Stadium. It’s Too long. Let’s cut to the chase and call it “Spurrier’s Swamp at BHGS”. Or, “The Swamp” for short. When he and Billy Donovan came onto the scene, it changed all Gator outlooks. Not to nitpick, but Danny might have something to say about who won the Heisman in ’96.